Looking for a Used WRX in your area? CarGurus has 4,882 nationwide WRX listings starting at $13,981. Hey, there is so a Subaru screamer! The Japanese automaker has bulked up its road-rally-ready WRX for 2015 and has disassociated it from the stodgy Impreza moniker, although they will admit that the tweaked-out track-tackling WRX lineup still rides on its straight-laced compact family 4-door progenitor’s chassis. But that’s where any comparison ends, including the availability of a hatchback version. Alas, you read correctly. The 2015 WRX no longer offers a 5-door vacation-ready hatchback option, thus trunk capacity is just that. But a wheelbase stretched by an inch or so is expected to bump said luggage-toting capability to just over 12 cubic feet, not to mention allowing rear-seat passengers a bit more legroom. And of course it’s expected that this 5-passenger performance sedan will return in the affordable Base trim, as well as the up-featured Premium and flagship Limited variations, with all trims once more sporting that spiffy Subaru tradition, standard full-time all-wheel drive (AWD). Noteworthy upgrades for 2015, meantime, may go unnoticed at first glance, but are slated to include a lighter frame, a sportier suspension, improved handling, upgraded seats and a redesigned center stack flaunting 2 LCD displays, an upper 3.5-inch multifunction screen and a lower 4.3-inch infotainment monitor that also integrates the available navigation functions. Also, a new flat-bottom steering wheel gives the redesigned dashboard an even more modernistic montage. Undoubtedly, the most anticipated change for the 2015 WRX, however, is a more potent 2.0-liter turbocharged horizontally opposed 4-cylinder (boxer) engine that loses a half-liter in cylinder size, but adds a few more horsepower and some 14 more lb-ft of torque. Thus power numbers from the unique flat 4 now stand at 268 hp and 258 lb-ft of torque, all of which is managed by the standard… and brand new… 6-speed manual transmission. In yet another departure from the 2014 version, a shiftable continuously variable transmission (CVT) that flaunts steering-wheel-mounted paddle shifters in driver-selectable 6- or 8-speed variants also debuts in this year’s reworked rally reveler. Additionally, the available CVT adds a new dimension to the AWD system, allowing a bit more flexibility in maneuvering snow-covered roadways. Mileage, meantime, remains estimated at 19 mpg city/25 highway with the 6-speed stick shift. Although details are still sketchy, look for the next-gen WRX trims to go on sale in the spring of 2014 carrying such bling as 17-inch alloy wheels, premium cloth upholstery or, in the Limited trim, leather upholstery that covers heated power-adjustable front seats. Heated power outside mirrors and a power moonroof also adorn the Premium and Limited versions, with cruise control, telescoping tilt-wheel steering, single-zone climate control and Bluetooth hands-free communications again delivered with all 2015 trims. Look for this nimble 4-door to additionally sport a single-CD player with 6 speakers, all integrated with a USB port, while the Premium and Limited trims are slated to remain eligible for an optional premium audio system boasting satellite radio and a Harman Kardon audio system sporting a 10-inch powered subwoofer. Further available equipment, depending on the trim selected, should remain the aforementioned navigation suite, remote engine start, a power sunroof and Subaru’s somewhat maligned Starlink upgraded infotainment offering and smartphone apps. Finally, standard safety equipment across the 2015 WRX trim spectrum is expected to remain anchored by 4-wheel antilock braking (ABS), traction and stability control, front side-mounted airbags, and front and rear head airbags. Also, look for daytime running lights as well as a remote antitheft alarm to return to the lineup, while the Premium and Limited should retain their standard front fog/driving lights, and the Limited will again bear xenon high-intensity-discharge (HID) headlights. While this sporty little Subaru won’t cause the folks at Ford’s Mustang division or GM’s Camaro builders to lose any sleep, it might just put a little more pizzazz into the commute while allowing you to laugh at the weather. 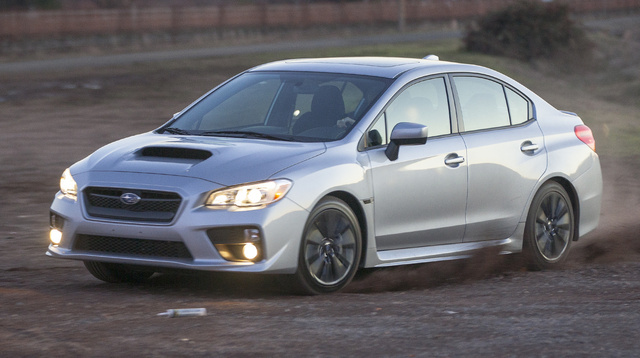 What's your take on the 2015 Subaru WRX? Have you driven a 2015 Subaru WRX? 2015 Wrx Base Tire Swap! ?